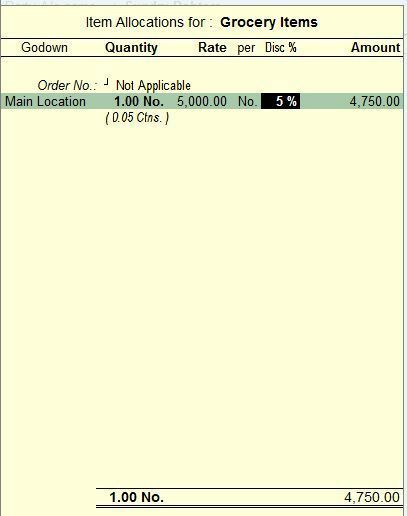 In this tutorial, We know about how to show discount in Tally.ERP9 Invoice. But first we know about what is Discount? In simple terms, discount an allowance or concession in price. Discount is given on the product, so that the buyer is induced to place an order and later to make the payment. Discount can be also referred to as a type of deduction in product base price. The Seller deduct the Discount from the gross or total price, and the buyer is supposed to pay the net amount. Cash Discount is an allowance or concession given by the seller to the buyer. This discount is offered to encourage the buyer for quick payment or settlement. It is allowed for immediate payment of cash payment within a short period. The Cash discount is normally shown in the quotation and invoice. It is deductible from the total price and the buyer is requested to pay only to the net amount. Cash Discount is usually stated in the percentage form. Trade Discount is a reduction in the catalogue price of the goods allowed only if the quantity ordered by the buyer is quite large. Its purpose is to encourage the buyer to make bulk purchases. It is allowed on cash as well as credit sales. The Trade Discount is not shown in the books of account. The Trade Discount is calculated as some percentage of the cataogue price. It is varies according to the quantity of Order. Lets Know how to configure Discount in Tally.ERP9. Remember again, Discount only can be shown on inventory not on ledger account. 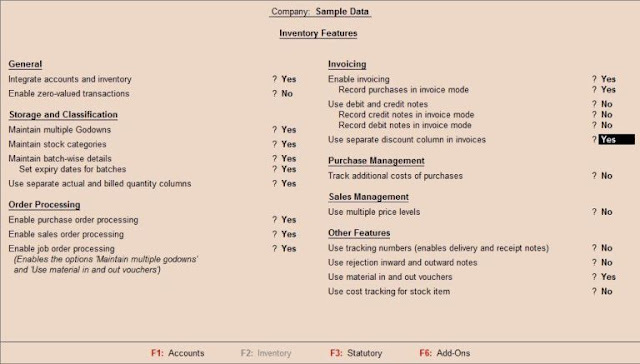 First you need to create account with Inventory in your tally data. Go to Accounting Vouchers – Press F11 – Accounting Features – Selection Yes to Integrate Accounts & Inventory – Accept yes. Your data is ready to maintain inventory. For Example Sumit Purchase Grocery Items for Rs. 5000 from Departmental Store & Get Discount of 5%. It means discount on product is Rs. 250 and net payable is Rs. 4750/-. Now pass a Sales Voucher Entry. If voucher open in normal invoice mode then Press Ctrl + V, this switch your voucher to Invoice Mode. Select Inventory, Enter Inventory Allocation, You can see there is Disc Column (as see in below pic). I have entered Grocery Items cost of Rs. 5000 & allow discount of 5% and net value is showing Rs. 4750/- as per above example. Enter the required value and discount and save the voucher. Open the same voucher again and you see the discount column in the invoice and invoice is generate for Net Value.